While analytics have a bad reputation, are security operators using them? In a new end user survey, we asked "Do You Use any Intelligent Video Analytics (virtual tripwire, people counting) currently?" and then requested they explain why they did or did not. Additionally, clear trends existed across the size of an end user's deployment. In this note, we dig into each of these areas. Undoubtedly, both segmentations show the limited overall use of analytics but the trend also showed the difficulty of analytic adoption in smaller camera systems. While our survey focused on larger overall deployments, we suspect that the traditional 32 camera and under mass market would have even greater barriers to adoption. The most common answer shared was that end users do not have the need or desire for analytics. "not very important in my work"
"No need for any of this." "Currently there is no desire." "Not needed for low to medium security application"
"Have not had a need for analytics." 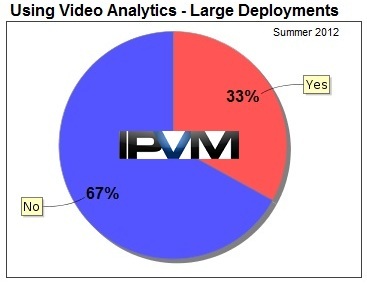 We are skeptical about these results and suspect they more reflect the lack of acceptance of video analytics. In our experience, almost all users could benefit from high accuracy, low cost analytics. "There is to many issues in that part of the market to feel comfortable making the investment in the technology." "We are interested in using in the future if the reliability improves and costs come down some. Reliability is what we're really looking for." "We have participated in demos of Intelligent Video Analytics with noted reliability issues"
"Not applicable because of the lack of proveness." 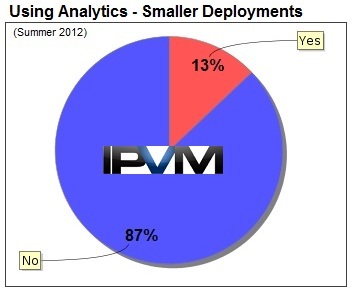 "We included analytics in our 2011 camera deployments. It has not been very successful given the types of behavior we're tracking. Analytics is not a priority for us." "We purchased a system and cameras to do this, however, we have not been able to make it work." "Systems are not capable of doing this." "No one to setup and maintain on a regular basis." "Intelligent video is a force multiplier to our company allowing us to lower the security (manpower costs) and monitor thousands of cameras more efficiently." "Crossline detection to make specific detection project and analytics to detect people and cars in specific zone." "We will now begin using for vehicle entry purposes." "We use facial recognition, LPR, and and advanced form of motion called advanced object by our vendor that allows us to capture, motion but also direction of travel, size of different objects, and color." "We use people counting are looking at object detection and other potential uses for our working enviroment"
"VideoIQ HD cameras for exterior intrusion detection in fenced areas." "Video contains a lot of information that is time consuming to extract. Analytics allow faster extraction, with less human interaction and in my experience increases the accuracy of reports and pulled video. I wouldn't be able to create the number of video metrics I have without analytics."